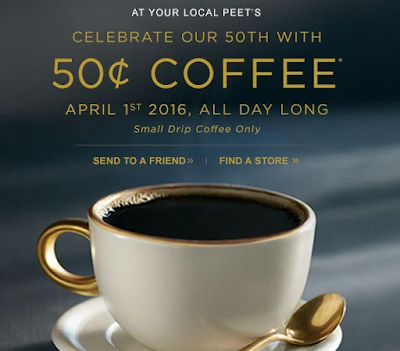 Savvy Spending: Peet's Coffee: 50 cent coffee, today only! Peet's Coffee: 50 cent coffee, today only! If you have a Peet's Coffee near you, swing by to pick up a 50 cent cup of coffee today! They are celebrating their 50th anniversary by offering this deal today, 4/1, only! Offer valid at participating Peet's Retail and Capital One locations only April 1st, 2016. Excludes airport, supermarket, and other licensed locations. Offer for a small drip coffee. While supplies last.